Tireless New York Times columnist and Nobel-prize winning Princeton economist Paul Krugman has long played the role of Cassandra, warning of disasters while the architects of policy look on, shake their heads, and ignore him. I’ve sometimes wondered how he stands it. Well, it turns out that, like many people, Krugman’s long view is informed by epic narrative. Only in his case, it’s neither ancient scripture nor Ayn Rand. 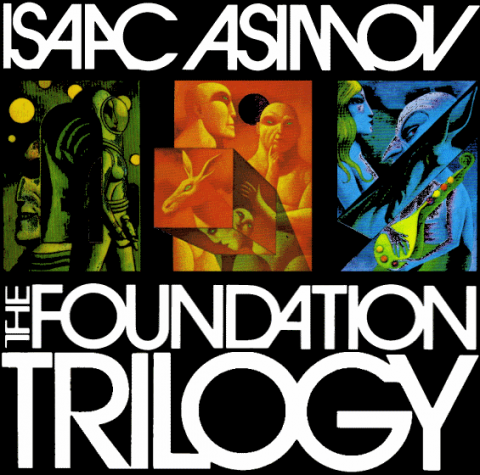 It’s the Isaac Asimov-penned Foundation Trilogy, which Krugman, in a recent Guardian piece, dissects in detail as a series that informed his views as a teenager, and has stayed with him for four and a half decades. The hero of the trilogy, Hari Seldon, is a mathematician, whose particular branch of mathematics, called psychohistory, allows him to make massive, large-scale predictions of the future. This science informs “The Seldon Plan” that silently guides the coming of a new Galactic Empire thousands of years into the future. If it sounds a bit arid in paraphrase, it isn’t, even though Asimov’s characters tend to be thin and his descriptions lack in poetry. “Tolstoy this isn’t,” Krugman tells us. They remain, uniquely, a thrilling tale about how self-knowledge – an understanding of how our own society works – can change history for the better. And they're every bit as inspirational now as they were when I first read them, three-quarters of my life ago. He admits that the sentiments of Asimov’s fiction present us with a “very bourgeois version of prophecy,” but then, economics is a very bourgeois science, mostly concerned with one emotion, “greed.” Nonetheless, Krugman believes in the power of “good economics to make correct predictions that are very much at odds with popular prejudices.” And we could all do with fewer of those. Or listen to the Spotify version up top. You can find this audio listed in our collection of Free Audio Books.